Bob’s priority is to keep a low profile rack in front of the listening couch in Studio A to minimize acoustic interference. His other priority is managing the gear patching while maintaining the highest sound quality. Enter Israeli genius Igor Kapelevich of I. J. Research. Igor’s team built and programmed an analog Mastering Transfer Console for us (dubbed the K-1 Mastering Transfer Chain) which has more power and flexibility in a single rack space than has ever before been accomplished. 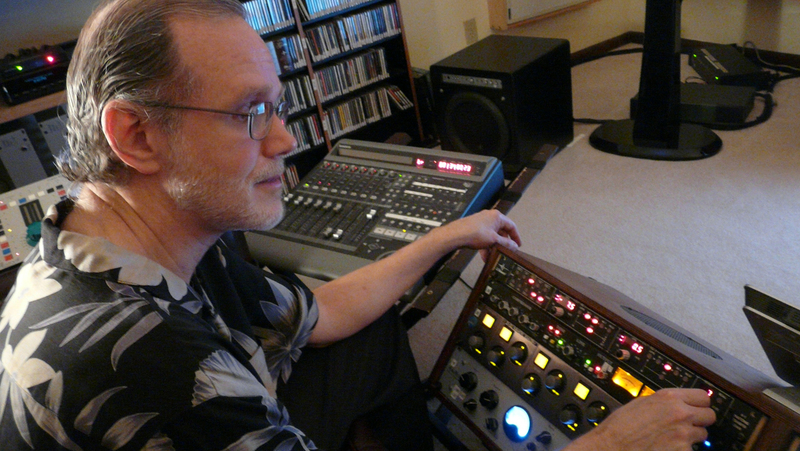 All of Bob’s analog gear can be patched and manipulated in the most purist manner. This console can really perform tricks. Igor’s rep, Aran Lavi, who is also a recording/mixing engineer and who speaks better English than Igor, or Igor, or ask Bob for any information you’d like. The K-1 Mastering Transfer Chain Sits in 1-U Rack Space! 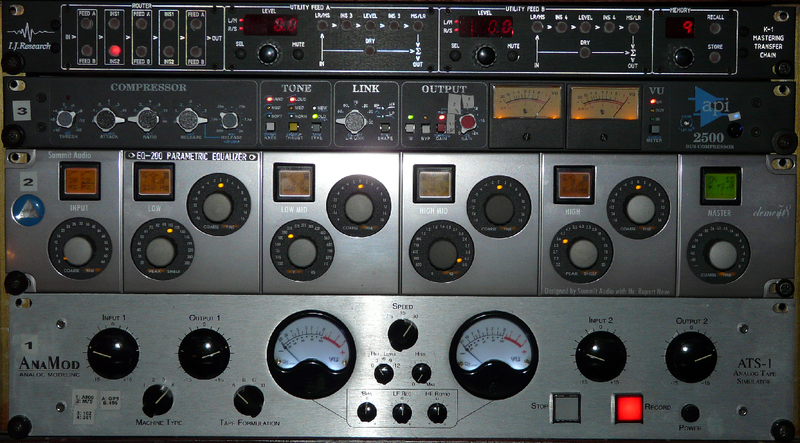 Analog gear can be inserted in virtually any order, levels precisely adjusted, processing performed in stereo or M/S and compressors can be in serial or parallel! 16 memories allow instant comparison of settings or different devices! This closeup of the ROUTER section shows that patching the gear and changing the order is as simple as pressing a button. In this example, signal comes into the input at left (from the insert DAC), enters “Feed A” which has the API compressor inserted, then goes to “Insert 2”, which has the Summit equalizer, then to “Feed B”, which precisely controls the output gain and to the insert ADC. Notice that the same patch could be obtained by pressing combinations of the first three buttons instead, so there is a lot of versatility in patching. If no lights are lit, then there is a completely passive route from DAC to ADC. 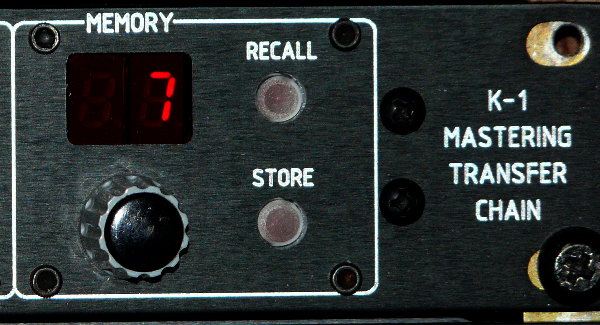 A memory controller allows instant recall of all settings, patching and comparing of patches. This closeup of “Feed A” shows how easy it is to set up a parallel compressor (The API 2500 can make a fantastic parallel compressor). The parallel path is engaged by pressing the “Dry” button which sums the “dry” signal with the signal from the compressor. In this example, the compressor is inserted via “Ins 3” and its level is mixed in at -7.5 dB gain, a fairly strong amount of parallel compression. Of course the settings of the compressor itself affect the total sound. At this setting, there is significant compression of low to mid level signals, but the loudest signals come through with little compression, helping to get that “fat” sound without damaging the loudest dynamics. The K-1 Mastering Transfer Chain is a purist analog router/mixer with a digital brain! We could switch between different settings of parallel compression, for example, or compare parallel compression versus a simple gain control to see if the sound really gets better. It’s flexible, powerful, and fun to use.